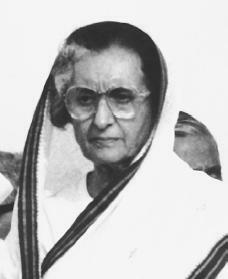 Indira Gandhi, a prime minister of India, was the most effective and powerful politician of her day in that country. Considered a hero by her supporters and cursed by her enemies, who later assassinated her, Indira Gandhi paved the way for democracy in India during the twentieth century. Indira Priyadarshini Gandhi was born in the northern Indian city of Allahabad on November 19, 1917. She was the only child of Jawaharlal Nehru, an important figure in the nationalist movement, a movement devoted to the improvement of culture within the nation. Later he became India's first prime minister. Because of many of his political beliefs, Jawaharlal, along with much of his family, was often jailed for supporting Mohandas Gandhi's (1869–1948) nationalist movement. Mohandas Gandhi (no relation to Indira) opposed the dominant rule of Great Britain over India. This association placed Indira at the center of India's struggle for freedom. Her family's fight for freedom made Indira's upbringing shaky. Her father was often absent from being jailed, and her mother was bed-ridden from tuberculosis, a terrible disease affecting the lungs and bones. Because of her father's stand against institutions run by the British government, Indira's early schooling was not consistent. For a while she was taught at home. Later she attended an academy run by a poet-philosopher. Shortly after her mother's death in 1936, Indira enrolled at Santiniketan University and Somerville College, Oxford University, in England. She married Feroze Gandhi (also no relation to Mohandas Gandhi) in March 1942, despite both family's objections, as the two were not part of the same social status or religions—he was a descendent of Iranian immigrants; she was Hindu. Feroze Gandhi became a lawyer and newspaper executive as well as an independent member of Parliament. Shortly after their marriage, they were both imprisoned for a period of thirteen months for their part in the nationalist political demonstrations against British rule. During her imprisonment Indira taught reading and writing to prisoners. Feroze Gandhi died in 1960. They had two sons, Rajiv and Sanjay. On August 15, 1947, Great Britain released their control over India and the Indian Empire was quickly divided into two countries, today known as India and Pakistan. No longer under British control, India erupted into violence. Thousands of members of rival religious groups, the Hindus and the Moslems, were killed during riots. During this time Indira served as her father's hostess and housekeeper. Since her father had never remarried after his wife's death in 1936, Indira took charge of her father's large mansion and began helping him in political matters. Together they worked towards peace, arranging a meeting of Hindu and Moslem religious leaders in New Dehli, India. assuming the presidency of the organization in 1959, Gandhi was named to its twenty-one-member executive Working Committee. She was elected with more votes than any other candidate to the powerful eleven-member Central Election Board, which named candidates and planned electoral strategy. In June 1964, following her father's death, Gandhi became minister for information and broadcasting under Prime Minister Lal Bahadur Shastri (1904–1966), where she helped start an Indian television system. In January 1966, when Shastri died, Gandhi was elected leader of the Congress Party in Parliament (the governing body of India) and became the third prime minister of independent India. Gandhi assumed office at a critical time in the history of the country. A truce had ended the 1965 war between India and Pakistan only a week earlier. The nation was in the midst of a two-year drought, resulting in severe food shortages and a deepening economic crisis with rising prices and rising unemployment. The political situation in India was equally as effected. In the fourth general elections of 1967 the Congress retained majority control (and reelected Gandhi as its leader), but lost control in half the state legislatures. After twenty years of political dominance, the Congress Party was experiencing serious difficulty. Gandhi immediately set about reorganizing the party to make it a more effective instrument of administration and national development. Her goal was to achieve a wider measure of social and economic justice for all Indians. As her left-of-center policies (slightly liberal, or supporting civil liberties and social progress) became clear, the Congress Party split, with the younger, more liberal elements rallying around Gandhi and the older, more conservative party leaders opposing her. This division came to a head in July 1969 when she nationalized (brought under the control of government) the country's fourteen leading banks in a highly popular move meant to make credit more available to agriculture and to small industry. The split was formalized when Gandhi's candidate for the presidency of India, V. V. Giri, won over the party's official nominee. Although Gandhi took 228 members of Parliament with her into the New Congress, this was not a majority in the 521-member house, and she held power only with support from more liberal parties. In December 1970, when Gandhi failed to get the necessary support to abolish, or end, the privileges of the former Indian princes, she called on the president to dissolve Parliament. Midterm elections were set for March 1971, one full year ahead of schedule. A coalition, or alliance, of three parties of the right and an anti-Congress socialist party opposed Gandhi, who made alliances with liberal parties as well as some regional parties. Her platform was essentially one of achieving social and economic change more rapidly in an effort to improve the quality of life of India's people. Her party won a massive victory with over a two-thirds majority in Parliament. Gandhi faced major problems in the areas of food production, population control, land reform, regulation of prices, unemployment, and industrial production. The problems were increased by the arrival in India of almost ten million refugees, who were uprooted as a result of the civil unrest in East Pakistan. In November 1971 Indian troops crossed into East Pakistan to fight Pakistani forces. A month later Gandhi announced recognition of the Bangladesh government set up by East Pakistani rebel leaders. On December 16 Pakistan's commander in East Pakistan surrendered to India. In the state elections held in India in March 1972, Gandhi's New Congress Party scored the most overwhelming victory in the history of independent India. However, her opponent accused her of violating election laws, and a high court supported the charge in 1975. Because of this development, as well as domestic unrest, Gandhi declared a state of emergency and postponed elections. In the 1977 elections Gandhi and her party suffered major defeats and Gandhi eventually lost her seat and the post of prime minister. The following year Gandhi headed the Congress Party as she returned to Parliament. In 1979 she again became prime minister. In efforts to prove India's nonalliance in the global community, she visited both the United States and the U.S.S.R., the former Soviet Union, which consisted of Russia and several smaller states. Internally, riots broke out among Muslim, Hindu, and Sikh religious sects, or groups. Sikhs, looking to separate themselves from India, secured weapons within their sacred Golden Temple in Amritsar, and assumed religious protection. Gandhi ordered government troops to storm the temple, leading to many Sikh deaths. This led to her assassination at her residence on October 31, 1984, by her own Sikh security guards. In death, Gandhi remains a symbol of courage and democracy in one of the world's most populated countries. Ali, Tariq. An Indian Dynasty: The Story of the Nehru-Gandhi Family. New York: Putnam, 1985. Frank, Katherine. Indira: The Life of Indira Nehru Gandhi. Boston: Houghton Mifflin, 2002. Greene, Carol. Indira Nehru Gandhi, Ruler of India. Chicago: Children's Press, 1985. Jayakar, Pupu. Indira Gandhi: An Intimate Biography. New York: Pantheon Books, 1993. Very concise and helpful for a brief refresher on a very interesting time in Indian politics and life. Thank you. INSPIRING BY INDRA GANDHI. HER ACHIEVEMENT TOWADS POLITICS. SOCIAL WORKS.